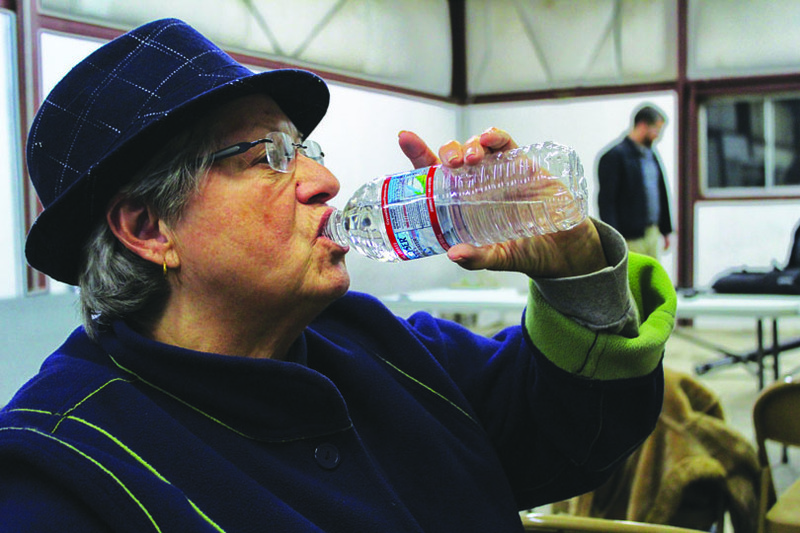 Jean Aider “enjoying” a bottle of CG-Roxane water at a December 2 meeting. The Crystal Geyser-Roxane water bottling plant in Olancha is responsible for leaking arsenic into the ground, and investigations by the Lahontan Regional Water Control Board are trying to determine the extent of the contamination. However, investigators are trying to determine how much arsenic is naturally-occurring, and how much Roxane should take the blame for. There was no groundwater monitoring of arsenic levels prior to Roxane’s discharging, and no baseline or background levels to use for comparison to the contamination. When Roxane began operation in Olancha in 1990, the Food and Drug Administration’s acceptable arsenic levels were 50 parts per billion (ppb). The Environmental Protection Agency lowered it to 10 ppb in 2001. At the time of the change, Roxane was bottling at 15 ppb, according to Senior Hydrologist Mark Grivetti of Geosyntech, the third party firm hired by Roxane to examine the hydrogeology of the aquifer from which it draws its water. This change required Roxane to filter the excess arsenic and dispose of it. Unfortunately, it was disposing of the arsenic into a non-permitted and leaky pond, aptly named the Arsenic Pond, The Sheet reported in April of 2015. Roxane has since removed the Arsenic Pond, and the heavy metal is now being filtered, captured and shipped to a proper disposal site, Anne Holden, engineering geologist for Lahontan, told The Sheet. Arsenic levels are low enough at Cabin Bar Ranch wells that filtration will not be necessary, she said. Roxane is also applying for permits to build a larger bottling plant at Cabin Bar. The arsenic levels in July 2015 near the pond were approximately 700 ppb, said Lahontan’s Kathe Pool. Levels have now dropped to between 100 and 200 ppb, Pool said at a meeting held on Friday, December 2 in Olancha. The meeting was also a chance for public comment on permits for the Cabin Bar facility and the original facility. The biggest arsenic pond is the Owens Dry Lake, adjacent to the plants, which has levels of the heavy metal that are off the scale—hundreds of parts per million—and is distorting the background. Arsenic levels vary in water samples near the facility due to its proximity near Owens Dry Lake, says Anne Holen. Holden explained to The Sheet on Tuesday, December 6, that putting a monitoring well up-gradient (upstream) of a site can usually determine a background or the composition of an uncompromised site. That test doesn’t really work in this situation as arsenic levels vary from around the entire facility. Grivetti explained that the water level and shoreline of Owens Lake has gone up and down many times over the eons. When the water level was high, sediment, including arsenic, was deposited up to the edge of the shoreline. When the water level receded, the sediment remained. This layer of sediment was then covered by decomposed granite and other deposits that are slowly stripped away from the Sierra Nevada by the elements and fill the valley floor.